Love is the richest and greatest gift that God gave to the world sending his son Jesus Christ to come among us, to be born of a human mother, and to make the way of the cross to be the way of life. Love between a man and woman which matures into marriage is one of God’s most beautiful types of love. At First Presbyterian Church of Littleton (FPCL), we celebrate that love through the Christian wedding ceremony consecrating the union of man and woman in God’s name. 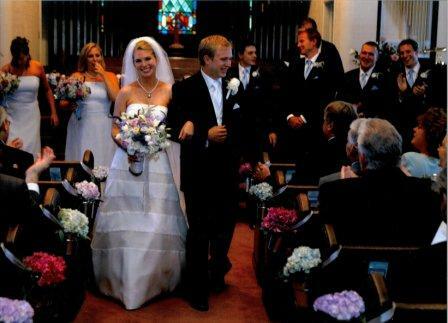 The Presbyterian Christian wedding ceremony guides couples toward a deeper Christian understanding of marriage. Wedding ceremony guests become participants in a service of worship that affirms marriage as God’s gift to humanity and invites those present to “rejoice that marriage is given by God, blessed by our Lord Jesus Christ, and sustained by the Holy Spirit.” Couples pursuing a Christian wedding seek to bring their marriages into accord with the will of God and to allow their relationship with Christ to form the pattern for the covenant of marriage. Moreover, they assume that the promises of marriage are to be made in response to the Word of God, in the context of prayer, and in the presence of the community of faith. For more information please download our Wedding Guide. If you are interested in being married at FPCL, let us know by email or at (303) 798-1389. 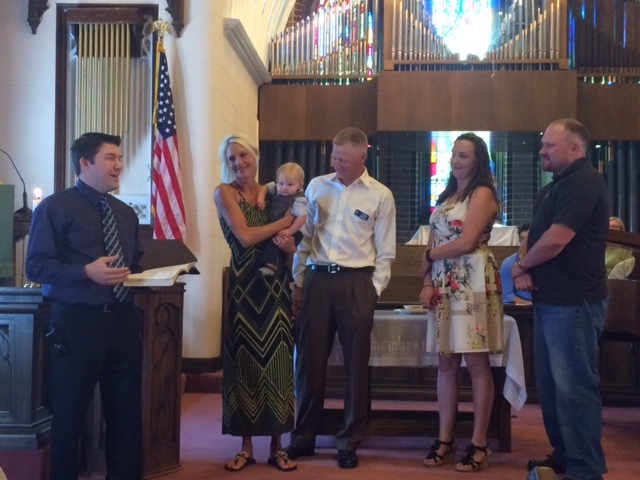 First Presbyterian Church of Littleton (FPCL) baptizes both infants and adults “in the name of the Father, and the Son, and the Holy Spirit,” one of the most ancient and universally used formulas in the Christian Church. Presbyterians believe that baptism with water, practiced only once in a lifetime, is the sign we were given by God to symbolize the cleansing of sin and adoption into the family of the church, unifying the people as a community of faith. The water of baptism reminds us of the waters of creation, the Flood, the Exodus from Egypt, and of God’s promises to previous generations. At a baptism, the congregation of FPCL is commissioned to share in the newly baptized persons’ belonging and membership, promising to guide, teach and nurture them as the learn and grow in their own faith. If you are interested in being baptized or having your child baptized, let us know by email or at (303) 798-1389. “None of us lives to himself, and none of us dies to himself. If we live, we live to the Lord, and if we die, we die to the Lord; so then, whether we live or whether we die, we are the Lord’s.” – Romans 14:7-8. Christians do not bear bereavement in isolation but are sustained by the community of faith. Therefore, First Presbyterian Church of Littleton (FPCL) invites persons to use the church for Christian funeral services. Funeral services shall be directed by FPCL’s pastor and others may participate as leaders in the service. Christian funeral services may include scripture readings, worship songs, prayer, a pastoral message, an affirmation of faith and sharing of a eulogy, witnessing the ways in which the deceased acted out their faith in God. The Christian funeral service is concluded by commending the one who has died to the care of the eternal God. FPCL welcomes your interest in planning and observing a Funeral service at the church. Please let us know by email or at (303) 798-1389. 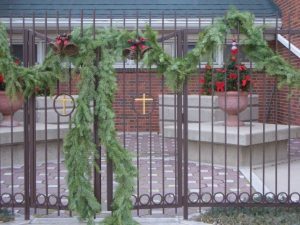 The Columbarium provides repose with permanent care for the cremains of members and friends of the First Presbyterian Church of Littleton and their families. It is a resting place of serenity and peace located in the courtyard adjacent to the Windermere entrance. There is a measure of comfort for you and your family in making arrangements prior to the time of bereavement. Today, as space is becoming limited and cremation more acceptable, many churches are adding a Columbarium. Our Columbarium has two kinds of crypts available as an affordable option to traditional burial. Individual crypts have space for one or two urns, or communal crypts are available for those who do not wish a separate site. 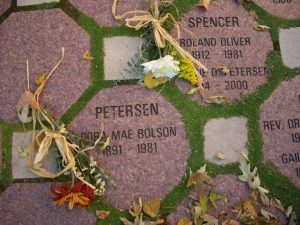 Crypts are covered with granite pavers and are surrounded by well-maintained plantings, flowers in season, and stone benches for rest and meditation. An ornamental wrought iron fence with a gate secures the area. For more information, please let us know by email or at (303) 798-1389.